Course Description: This two-day course is designed to provide participants with the skills and knowledge to implement case management services. 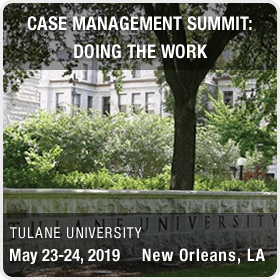 The course will deliver an overview of high-impact case management practices as well as focus on the application of case management techniques with unique populations. Using an interactive format, participants will watch video demonstrations of case management services in action and then engage in discussion with the presenters and fellow participants regarding the skills and techniques demonstrated in the video. Unlike other certification courses through NaBITA or training events, the entire focus of this summit will be on practical skill development to assist Case Managers and those working with the BIT to improve their interactions with students, faculty and staff. Ideal Participants: This course is ideal for administrators in either a full-time case management role, or in a position where case management services are part of their overall job duties. Those working with the BIT, student conduct, academic support, disability services and even front office customer service will benefit from this summit. To register at Member Rates, the anticipated attendees must have an active Team or Super NaBITA Membership or each registrant must be an active Individual Member of NaBITA. For more information on membership please contact NaBITA at (484) 321-3651 or info@nabita.org. Please click here to view the training agenda. NaBITA’s policies provide additional guidance regarding complimentary trial memberships. Each day of training will run 8:30AM-4:30PM. Registration will begin at 8:00AM. Attendees can purchase a parking pass here. Enjoy your visit and learn about New Orleans here!